Trangia stoves have a very good reputation in the world of camping and outdoor activities and rightly so. They are made to use in extreme weather conditions, are lightweight and compact and are made to a high standard. So when we were offered the opportunity to try one out we jumped at the chance. We were the sent the Trangia 27-6UL which includes the Stove, 2 non-stick 1 litre saucepans, 1 18cm non stick frying pan and a 0.6 litre aluminium kettle. Everything fitted together into a compact bundle with a quality strap holding it all together.The whole lot took up barely any room in our boot and because the stove uses methelated spirit for fuel there was no need for a big gas canister. It is also cheaper than using gas. In terms of family camping, if you intend to cook big family meals while you are camping this won't really do the job. You would need a two ring stove for that. We tried to cook our sausages on it but it took quite a while due to the quantity of sausages and we needed to keep moving them around as the heat is concentrated on the middle of the pan. However, if you tend to eat out when you are camping and just want a stove for your morning brew, or a mug of mulled wine in the evening then this is perfect as it takes up such a small amount of space in your boot, is fuel efficient and quick to assemble. It is also brilliant for heating up camping meals such as the Wayfayrer meals. 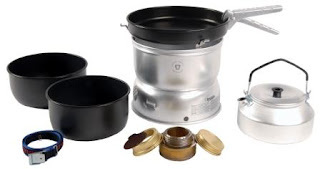 It is also worth noting that the pots and pans included in the set were superb and much higher quality than we are used to, so even if you think the stove is not for you, then I would strongly recommend you look at the Trangia range of accessories. And non-stick is definitately the way to go if you intend to have a fry up! The stove really comes into its own however for those of you who enjoy backpacking, hiking or mountain climbing. It is very lightweight and compact, as is the fuel, so will easily fit into your backpack. It is also very quick and easy to set up and use anywhere and has an inbuilt windshield that is storm proof. When the children are older and we manage to go on long hikes with them I know that this stove will be an absolute must take with us. Once again I find myself wishing I had discovered this product in my pre-Mummy days. This stove would have been perfect on archaeological excavations, long hikes and scuba diving trips. The Trangia stoves really are a fabulous bit of kit for outdoor activities or for lone/two person camping. 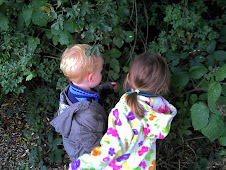 They're also very durable- our school had a set for Outdoor Education which survived many camping excursions.